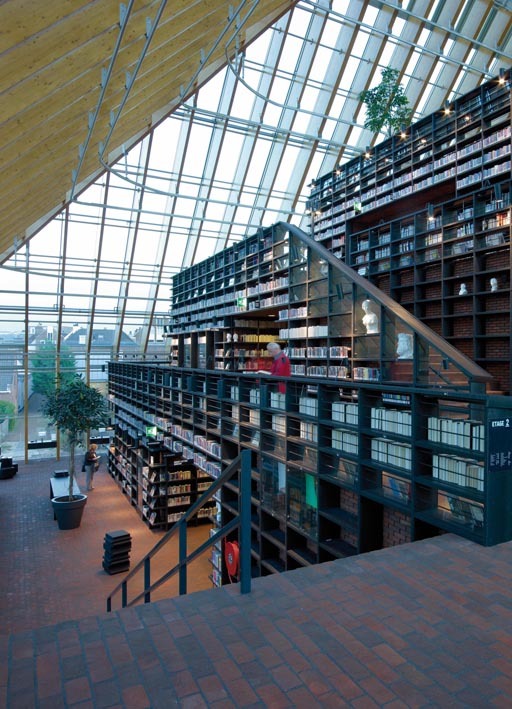 built in the dutch town of spijkenisse, the book mountain library is an innovative and environmentally-friendly project created by the mvrdv team of architects. 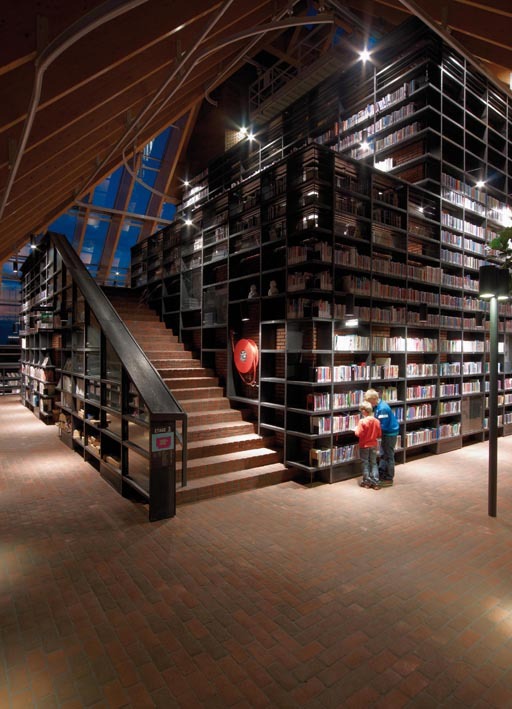 this new public library, which was recently awarded a prestigious red dot award, is part of a larger scheme, also entrusted to mvrdv, which includes the development of 42 adjacent homes. the scheme is designed in the image of an outsize farm and stands as a monument to spijkenisse’s agricultural past but especially, as well, to its future growth. 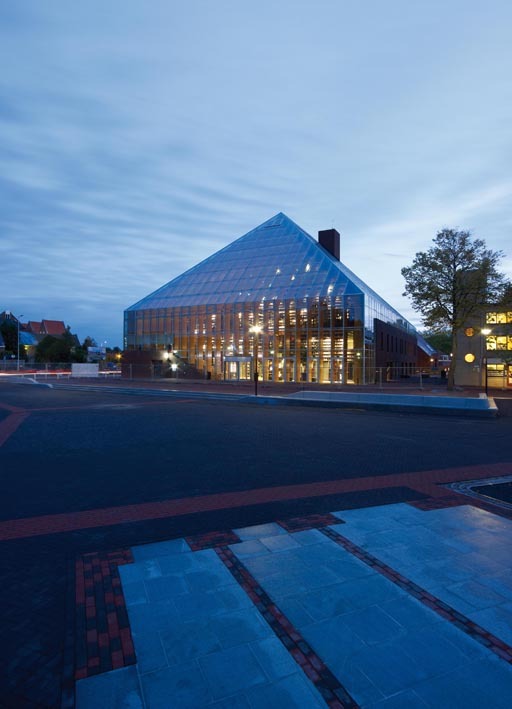 under a lightweight glazed pyramid structure, the building houses thousands of books along a continuous route consisting of reading matter and visitor interaction, leading almost to the roof. the library does not follow the conventional idea of keeping books in the dark to slow down the aging process of paper caused by sunlight; the books are actually stacked in an arrangement protected by a window that only gradually admits the rays of the sun. 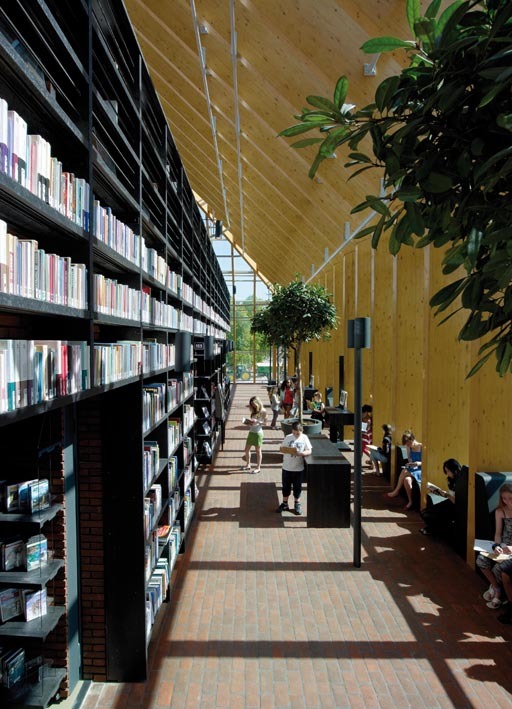 the exterior of the library reflects the shape and materials of a traditional dutch farm and the agricultural tradition of the town, which has evolved from an agricultural village to a new town over the last 40 years. another reference to its agricultural past is evident in the shelving system, made of recycled pots, which besides being cheap and extremely functional, are fire-proof and serve, at the same time, as a setting for the books, as railings and as counters. the interior is designed in an original manner as well; the bookshelves, extending upwards almost as far as the timber trusses through which natural light percolates into the library, lean against a central core, built of clinker bricks to give continuity with the exterior. a series of steps and walkways leads visitors through the pyramid of shelves, creating a continuous 480 metre route that terminates at a café with a panoramic view of the old town centre. the corridors are designed as wide internal roads, encouraging readers to stop and engage with each other. the spiral layout allows the books to be arranged in alphabetical order and floor by floor, one floor devoted to commercial texts, one to newspapers, one to children’s books, one to literature, one to reference only books and one to history. a cafeteria is not the only diversion from reading on offer; there is also an educational centre, a chess club, an auditorium, some shops and plenty of space to talk or sit at a computer. in summer, natural ventilation and sun screening ensure a comfortable indoor climate while, during the winter, the underfloor heating system and double glazing maintain an ideal temperature. the materials used throughout the building are of particular interest too, the timber structure, shelves made from recycled materials and the glass envelope, which makes everything inside fully visible from outside. the effect is one of an open-air library, like a glass bell, forming an almost invisible envelope that helps to soften the boundaries of the town. there is another striking aspect apart from matters of pure architecture and design, a social one; the pyramid is in fact designed to attract the inhabitants of the district where it is located, just a short distance from the central market square. about 10% of the population lives in this part of town; levels of education are low and the intention is also to arouse their curiosity and encourage them to get closer to the magical world of the written page. the lighting design prepared for the book mountain was based on the use of three types of light fitting. 35W, wide lens, metal halide handle spotlights were chosen for the shelving. these were designed to provide uniform illumination. in view of the structural constraints, posts were erected in the circulation areas with and without seating and fitted with light fittings of cylindrical shape with 42W fluorescent gear. finally, an led spotlight was selected for the dedicated reading areas, which not only saves energy but does not ‘heat up’ the books on display, causing them to deteriorate. in general, all the light fittings were placed at a certain distance from the books to slow down the aging process. the lighting design also included a series of emergency lights (trasparenze) for the exit routes. 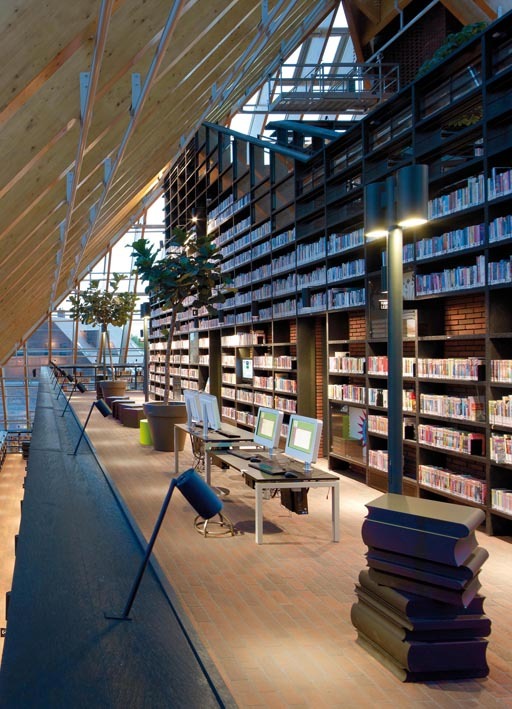 at dawn and dusk, as a result of this lighting design, the library turns into a ‘magic mountain’. the reading lamps and those above the bookshelves and in the alcoves create a mountain of twinkling lights. the tall street lights around the library add to the internal lighting, providing continuity between outside and inside. they also reduce internal reflections on the glass envelope, so that when you are inside at night, you can also see what is outside.